Mega Moolah Isis is the fourth online slot game of the mega Moolah progressive jackpot network. Like the two earlier slot games of this network. 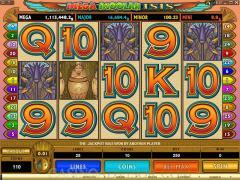 Mega Moolah Isis has been created by superimposing the Mega Moolah progressive jackpot on an existing slot game, in this case Isis. Isis is the ancient Egyptian Goddess of Motherhood and Fertility. The symbols on the reels are deep rooted in Egyptian mythology. Isis is the wild symbol and Hawk is the scatter symbol. The other thematic symbols are Ankh, Vase, Orb, Brooch and Lotus. The high value cards from 9 to A are also included. Crafted in great detail, all the symbols in Mega Moolah Isis are almost identical to the symbols in the original game. Only three coin sizes are offered in Mega Moolah Isis. These are 0.01, 0.02 and 0.05. However players can wager up to 20 coins per payline, which makes up for the low coin sizes. Players can enable up to 25 paylines. The maximum line bet is 1.00 credit and the maximum total bet is 25.00 credits. The bonus round for the progressive jackpot in Mega Moolah Isis is triggered randomly. The player is taken to a wheel having bands of four different colors, each standing for a progressive jackpot of a different level. The red color stands for the Mini Progressive jackpot, which starts at 10 credits. The orange color stands for the Minor Progressive jackpot, which starts at 100 credits. The blue color stands for the Major Progressive jackpot, which starts at 10,000 credits. The white color stands for the Mega Progressive jackpot, which starts at 1,000,000 credits. One the bonus round is triggered the player is assured of winning at least one of these four progressive jackpots. 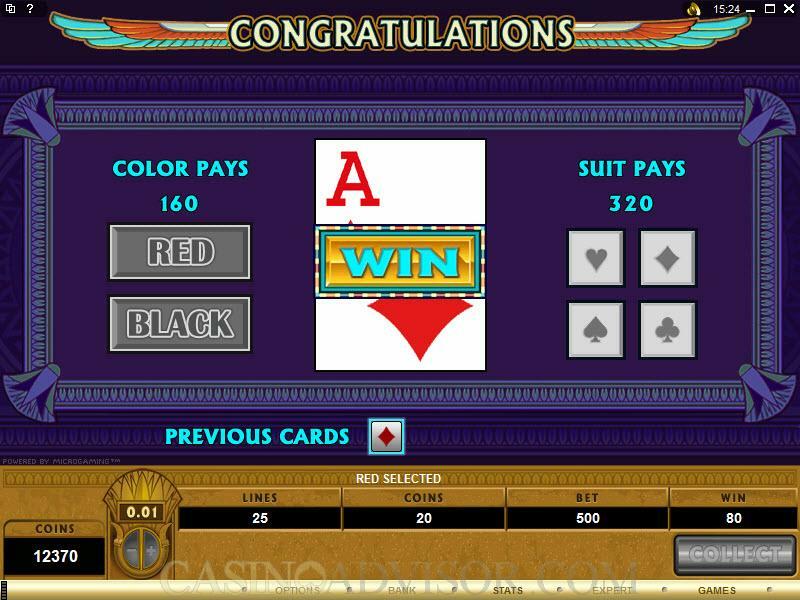 The wheel is spun and the color that comes to rest at the pointer indicates the jackpot won. 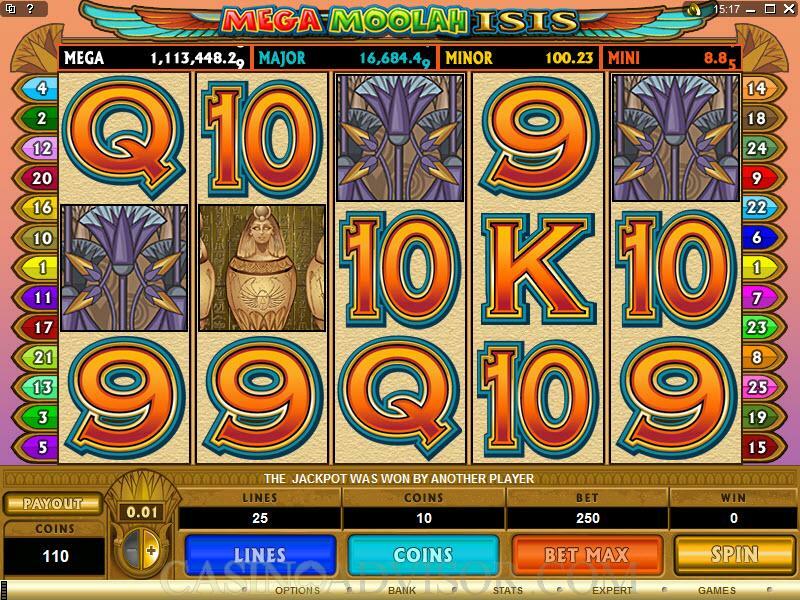 Mega Moolah Isis also offers Microgaming’s Gamble Game. 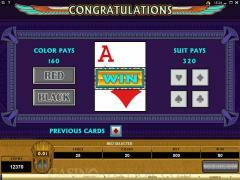 Players can voluntarily stake any of their winnings, except progressive jackpot winnings, in the Gamble Game. They can try to double or to quadruple their winnings. The gamble game can be repeated again and again till the gamble limit is reached. In order to double the winnings players have to guess the color of the card and in order to quadruple their winnings players have to guess the suit of the card. Mega Moolah Isis offers animations in the two main symbols, Isis and Hawk. There is background music as well. Interested in reading more detailed information about Mega Moolah Isis? If so Click Here for more details.